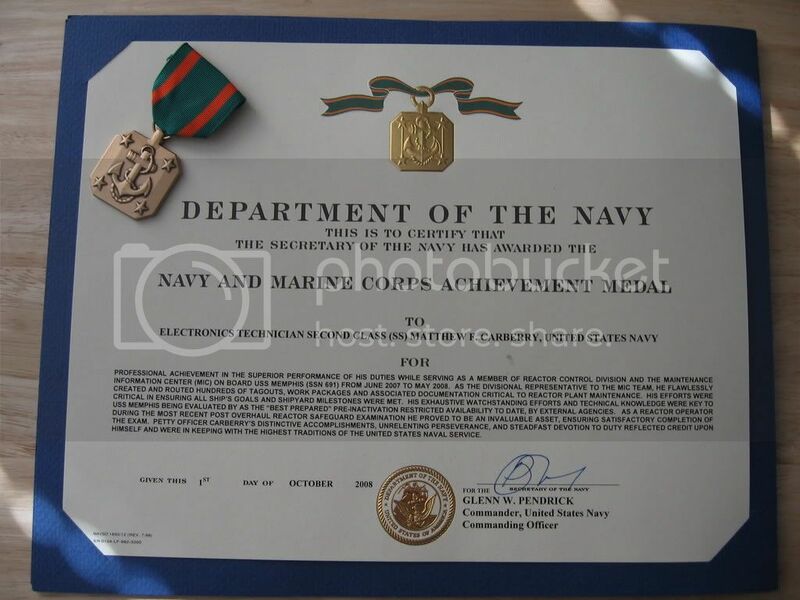 On Thursday, I received a long-promised Navy (and Marine Corps) Achievement Medal for the availability we completed in Portsmouth - five months ago, mind you. This is my first NAM; I am, after all, a nuke. We're not like Supply Department - for them, it's practically a semi-annual (or perhaps quarterly) requirement to "fire up the NAM cannon." I was very surprised by the number of people coming up to offer congratulations. I guess they attach more significance to the award than I do. This has never been about amassing a chestful of multi-colored candy...far from it. I'm proud of this achievement, and my service in the Navy as a whole, but the fact remains that I'm only really happy to be in the Navy on two days of every month - Wednesday was one of them, but Thursday wasn't. It seems to me that the NAM is overblown because of its importance relative to the amount of effort for which I was cited. My division had a light load during the availability, and while I did support other divisions on numerous occasions, there's a sense that this was an "easy" award. Many of my co-workers have expressed this sentiment as well, and I'm hard-pressed to disagree with them. If this were a fair world, I'd give the NAM to J. Raymond. His contributions were much more integral to the perceived success of the PIRA than were mine. But alas, since he left Memphis a month before our return to Groton, no medal for him. It actually took some jumping through hoops to get him even the customary end-of-tour award upon his detachment. The medal having been awarded, it really doesn't change any aspect of the reality facing me. The challenges at work are still present, as are the things associated with preparing to separate. Like everything else associated with this, I take it in stride and move on.